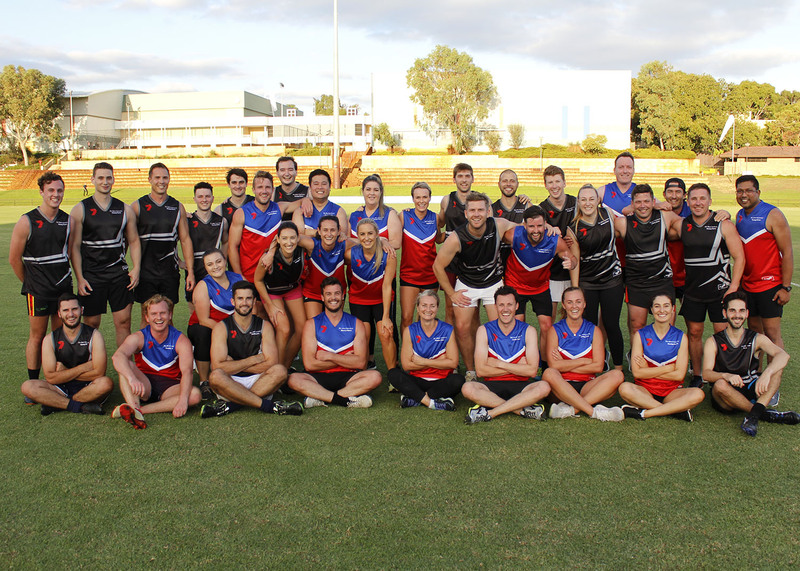 It was a case of history repeating itself with the dominant Advertising All Stars team blitzing the opposition and taking the trophy in the second annual Seven West Media AFL Challenge held last Friday at Leederville Oval. With a new look team of direct and advertising Seven West Media clients, the All Stars led by Jon ‘pipes’ Sharp took advantage of the cyclonic winds blowing their way in the first half to make their move. Seven Sales Director Damian Hampson delivered his now infamous half-time spray in an attempt to rally the Seven West Media team. But it was not enough as the All Stars held their opponents at bay before kicking away to win 8.4 (52) to 6.0 (36). The All Stars’ superior athleticism was a factor throughout the match with key performances from Bec ‘Polly’ Farmer, Carla Antoniolli and Ryan Proud. Sam Giuffre showed shades of Chris Judd circa 2006, splitting a SWM pack of three with his silky foot work yet could not convert. Longreach’s Luke Driscoll was the star, however, with the Seven West team having no answer for the dynamic agency star. Bart Atkinson showed his dominance with a defensive mark over four players, while Annette Herbert was a shining light with her well-known courage and tenacity. Graeme ‘Freo’ Freeman was reported for rough conduct after an ugly clash with opposition players. While the important All Star showed plenty of zip gaining lots of handballs received and was a key player for the victors, he was regarded as a pest and could have been called a seagull at time. He received a second booking for abusing the umpire. First time umpire Kate Molinari showed true professionalism after being handed her first whistle right before the match and ‘not really’ knowing the rules. Mick ‘Razor Ray’ Hart finally took up his dream of umpiring this year. It suited him – showing class with his decision-making and fair calls. Both teams were buoyed by the expert commentary/sledging of Channel Seven’s Mark Readings and a much-improved performance from Andy Ward. But it wasn’t enough for the battered and bruised SWM team, whose big talk couldn’t get them across the line. The All-stars now sit 2 – 0 with some big time soul searching to be performed by SWM in the off season.